Ancient Rome was a kind of society where class structure not only existed but was strictly enforced. In a way, this was natural for a society which consisted of a sizeable number of slaves and where people from different ethnicities lived. Various factors were considered decisive in determining the status of a free Roman in society. These factors included ancestry, census rank based on wealth and political privilege, attainment of honours, and citizenship of which there were various grades. Further classes included those of non-citizens and slaves. The population of ancient Rome continued to rise and decline due to various reasons. At the peak of the empire in 160 AD, the population of Rome has been estimated to be about 60 million with a population density of 16 people per square kilometre. Rome also had a very high rate of urbanisation compared to other societies of the same period. At the height of the empire, the population of the city of Rome has been estimated to be more than one million which remained the highest population in a European city till the nineteenth century. 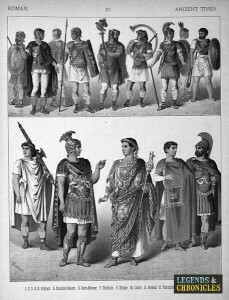 Examples of many classes from ancient Roman times. Looking at the history of ancient Rome, you can see the class structure seems to have existed from the very early days of Rome. In the days of the Roman Kingdom, the most crucial distinction in the Roman society was between the patricians and the plebeians. Patricians were the elite who held the political, administrative, and military power and who were thought to have been descended from the first senate established by the founder of Rome, Romulus. Plebeians, on other hand, were the rest of the common citizens. This distinction included only the males with the status of slaves, women, and children being much less. Roman citizenship was divided into various types which also reflected the ancient Roman class structure. The male citizens enjoyed the widest range of privileges but under certain circumstances, he could also be deprived of his citizenship. Women in these times were given a limited form of citizenship and did not have the right to vote or hold any public office. Women, however, had certain legal rights such as the right to own property, the right to obtain divorce, and the right to do business. Slaves of ancient Rome did not have any legal rights and were entirely at the mercy of their masters. Freed slaves, however, had limited rights and their children were considered free citizens of Rome. The distinction between the upper and lower classes was clear in the ancient Roman class structure. Patricians were the upper class people who wielded political and administrative power and enjoyed wealth. Lower classes, known as plebeians, indulged in all sorts of work but did not have the political and administrative power of the upper classes. However, it was possible for members of the plebeian class to become the political elite. For instance, Roman Emperor Augustus was of plebeian origin. The ancient Roman elite structure revolved around the patricians. The patricians wielded the political power and were always better represented in the Roman assemblies. The patricians dominated the political scene for centuries because they were always in majority in the senate. Further, at the beginning of the republic, only patricians could enter priesthood but that changed around 300 BC. The lower classes consisted of the plebeians who could attain material wealth but did not enjoy the political power. This included average working-class people who indulged in all sorts of ordinary professions including farming and labouring. There was a client-patronage relationship between many patricians and plebeians where the plebeians pledged their respect and favour in return for political and legal assistance from the patricians. Slaves in the Roman class structure did not have any legal rights and were entirely dependent on their masters. The upper class of Rome were typically involved the politics and decision making processes. 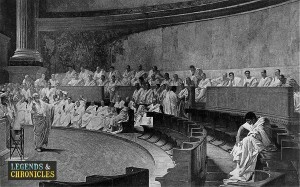 Apart from the distinction between the patricians and plebeians, there was a very important distinction between the senatorial class and the equestrian class in ancient Rome. The senatorial class consisted of all the men who served in the senate and wielded political power. Equestrian class, on the other hand, was of economic importance and any man who could prove that he possessed a certain amount of wealth could be enrolled in the equestrian order. It was also possible for a member of the equestrian class to become a senator, in which case he became a member of the senatorial class. The status of men was clearly much higher than women in the ancient Roman class structure. Men were the citizens who enjoyed all the political and social privileges in the public as well as private life. Women, on the other hand, did not have a right to vote and could also not hold any public office. However, they were allowed to do business, to own land, and to obtain divorce if they so wished. The rights of women were quite restricted compared to the rights of men in ancient Rome. The emperor was at the top of the hierarchy of ancient Roman class structure. The royalty was inherited and thus remained within the same family until some war caused a change in the ruling family. The emperors from Augustus in 14 AD until the emperor Commodus in 192 AD hailed from the same extended family. After that, for a brief period of about 40 years, several families ruled Rome, often clashing with each other. The class structure was an integral feature of the ancient Roman society. It was a clearly defined categorisation of the population of Rome based on their political privileges and social status. In this hierarchy of ancient Rome, the emperor was at the top and then came the patrician class which held the political and administrative power. Common people fell in the category of plebeians who could amass wealth but did not enjoy direct political power that others did. It was entirely possible for the Roman people to change their social standing in society. For instance, the slaves who were freed obtained certain rights and their children were considered free Roman citizens. The famous poet Horace, for example, was the son of a freed slave. Similarly, plebeians could obtain wealth and even political power while some patrician families fell into poverty during the middle and late Roman republic.